After looking into the National Fire Protection Association NFPA 72 2007 edition, I came across what I consider a mistake. Now this might be something that was intentional but I will explain my reasoning below. NFPA 72 2007 section 5.7.3.2.3.5 states that for smooth ceilings, all points of the ceiling shall have a detector within 0.7 times the selected spacing. Now this is no big surprise. We know that smoke detector spacing is determined by the manufacturer's recommendations which is typically around 30'. If we take 30' and multiply it by 0.7 we arrive at a new spacing for smoke detectors of 21'. This is the reason, NFPA 72 clearly states that for corridors or rooms 10' in width or less, smoke detectors can be located 20.5' feet from the end wall and spaced 41' between detectors. Knowing this information, "How many smoke detectors would be required to cover a room that measures 25' by 34'?". To find the answer we need to use the Pythagorean Theorem of A squared + B squared = C squared. This is the formula used to determine the distance of an unknown side of a triangle For example or room measures 25' x 34' so we will need to solve for 25 squared + 34 square = C squared. This equates to 625 + 1156 = The square root of 1781. The square root of 1781 is 42.2019. Now for someone who is new to this, it might seem kind of crazy to do all of this work to find out the quantity of smoke detectors required to cover a specific room size. However, it is quite simple. All we did by using the Pythagorean Theorem is determine the distance diagonally across the room measuring 25' x 34'. We now know that the room measures 25' Long x 34' Wide x 42.2019' Across Diagonally. Now using the 0.7 rule we know that all points in the room shall have a smoke detector within 21'. Clearly out diagonal distance of 42.2019' split is half is greater than 21'. With this information, we know that 2 smoke detectors are required to cover this space. NFPA 72 2007 section 5.7.3.2.4.2 deals with level ceilings of solid joist or beam construction. Note #5 within this code section specifically states that if the room is 900 square feet or less, only one smoke detector is required. If we take the manufacturer's recommended spacing of 30' for smoke detectors we can cover 900 square feet since 30' x 30' is 900'. Keep in mind that this is not incorporating the 0.7 rule found in NFPA 72 2007 section 5.7.3.2.3.5. This is where in my mind, the mistake is located. According to NFPA 72 2007 edition, 2 smoke detectors are required to cover a room measuring 25' x 34' if the room has smooth ceilings. However, if the room has solid joist or beam ceilings, you are only required to install one smoke detector. Keep in mind both rooms are under 900 square feet as we are using the same measurements for both scenarios. If anything this rule should be reversed allowing only one smoke detector in rooms with smooth ceilings measuring 900 square feet or less. Rooms with joists and beams will slow the movement of smoke across the ceiling to a point where additional smoke detectors may be required to achieve the same response time of the same room with smooth ceilings. The kicker is that NFPA must have caught this mistake as it has been corrected in the NFPA 72 2010 edition. 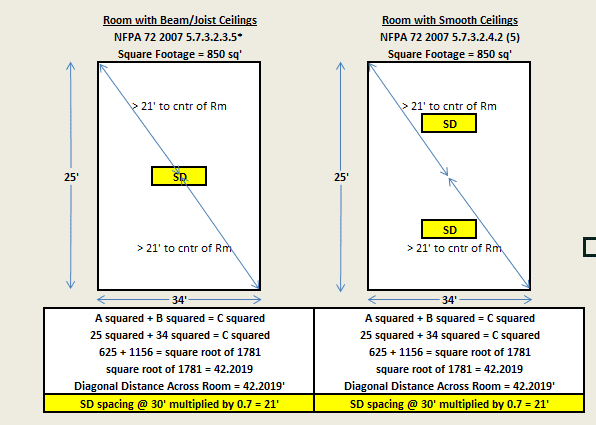 Now if you look at section 17.7.3.2.4.2(5) in the 2010 edition, it states that for rooms measuring 900 square feet or less, smooth ceiling spacing shall apply. This takes us back to the smooth ceiling spacing section which requires a detector within 0.7 times the selected spacing to all points on the ceiling. To recap, NFPA 72 2007 edition requires 2 smoke detectors for a room with smooth ceilings measuring 25' x 34' yet only requires 1 smoke detector if the room has solid joist or beam construction ceilings. NFPA 72 2010 edition requires 2 smoke detectors in both scenarios. If you would like to shed some light on this topic or just explain your thoughts, we encourage you to join our Facebook group.